One a day relief from hayfever and other allergies. 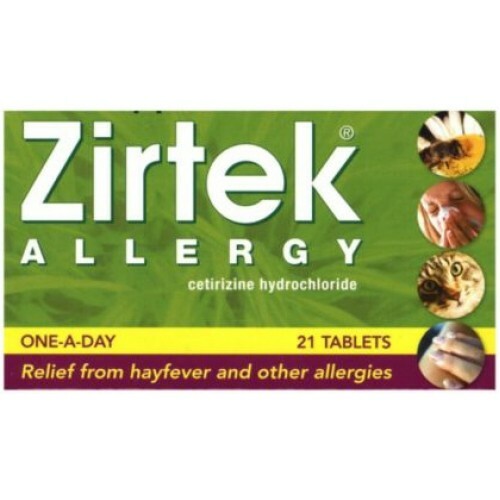 Zirtek Allergy offers once daily relief from symptoms such as sneezing; a runny blocked up nose; itchy and watery eyes as a result of hayfever or other allergies (eg dust, mould and pet allergies). Also relieves the symptoms of urticaria (hives and itchy skin rashes). Adults and children 6 years and over should take one tablet daily. Children aged 6 - 12 years may either take half a tablet twice daily or one tablet daily. If you forget to take a tablet, you should take one as soon as you remember, but wait at least 24 hours before taking your next tablet. If you are pregnant or if your doctor has told you that you have kidney problems you should consult your doctor before taking this medicine. You should not take this medicine if you are breastfeeding or if you have ever had an allergic reaction to any of its constituents. If you have been told by your doctor that you have an intolerance to some sugars, contact your doctor before taking these tablets. As with all antihistamines, you should avoid excessive alcohol consumption when taking your tablets. If you have ever had an allergic reaction to antihistamines in the past consult your doctor or pharmacist before taking these tablets. If you accidentally take a larger dose than recommended consult your doctor immediately. You may feel drowsy or dizzy, taking half your dose twice a day may reduce this. Zirtek Allergy tablets are not for use in children under 6 years of age. After taking Zirtek Allergy: This medicine does not cause side-effects in most people. However, as with all medicines, some people can react differently. Other rare side-effects have been reported such as bleeding and bruising easily, rapid heart beat, difficulty focusing, blurred vision, swelling, allergic reaction/shock, changes in liver function, fits, confusion, depression, aggression, weight increase, unusual limb movements, experience a bad taste in the mouth, fainting, hallucination, insomnia, bed wetting, pain and/or difficulty passing water, red and/or blotchy skin rash. If you notice anything unusual or have any other unexpected effects stop taking these tablets and tell your doctor. These tablets do not normally cause drowsiness. However, individuals can react differently to treatment. If you are affected you should not drive or operate machinery, but should persist with the tablets as any drowsiness doesn't usually last very long. Each Zirtek Allergy tablet contains: 10 mg of cetirizine hydrochloride together with microcrystalline cellulose (E460), lactose, colloidal anhydrous silica and magnesium stearate (E572). The film coating contains: hydroxypropylmethyl cellulose (E464), titanium dioxide (E171) and polyethylene glycol.